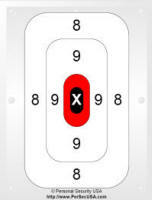 Below are zipper, diagnostic, center-of-mass, and "called number" targets that may help improve the quality of your pistol/handgun range time. Both can be printed at home on standard size paper. Click on a target picture below to get the PDF now, or scroll down for more details. 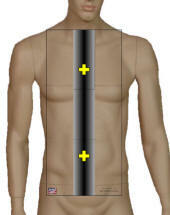 These targets help you practice the "zipper" technique (taught by John Farnam of Defense Training International) where you place your first shot in the low center-of-mass area, and then work up the torso as illustrated in this diagrams. The three-shot target is designed for higher capacity handguns or those who carry spare magazines. The two-shot target is designed for lower capacity semi-automatics and revolvers. The zipper targets are designed to uniformly distribute the available shots up a 24" torso. You start shooting at the lower aim point first, and then work your way up. 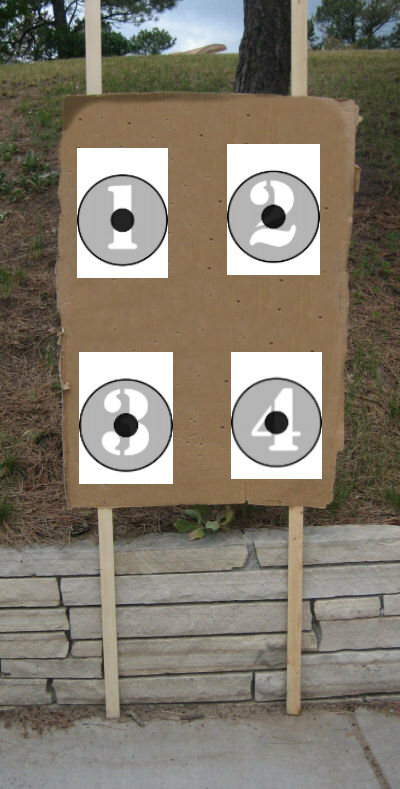 These targets are printed on three pieces of standard 8.5" x 11" of paper. Tape or staple the three pages together or onto the target backer as shown here, and you've got an inexpensive, full size target that is perfect for zipper training. Hint: When printing, select "Page Scaling: None". the dotted lines before assembling. The targets are designed to minimize ink usage so the mannequin is omitted from the printable target. You will need the Adobe PDF Reader to print these targets. For many shooters, the positioning of groups on a target relative to center can provide clues as to where technique can be improved. For example, if a right-handed shooter is constantly pulling groups right, it could mean too much finger is on the trigger. Here is a downloadable shot diagnostic target you can print and take to the range. If you know other's can shoot your handgun correctly (i.e. the sights are aligned), then this target can be used to help you understand how you can improve your groups. This PDF download has two pages: One for right-handed shooters and one for left-handed shooters. Be sure you are using the correct page for your strong-side hand. Just one note of caution: This diagnostic target is not the 'end-all' in correcting bad shooting technique. In fact, it can sometimes provide misleading guidance. Check with a certified instructor who can provide you with more accurate and detailed information on improving your shooting techniques. If you're along the front range or in Summit County, Colorado, feel free to and an instructor may be available to meet you at the range free of charge. 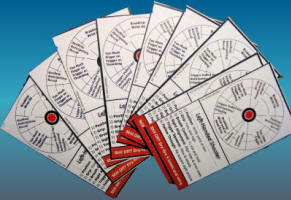 The information on these targets is also available in the handy pocket-sized Shot Diagnostics Wallet Card. This PDF document is designed to be printed on two-sided paper with five cards per sheet. You can use the laminator pouches available at office supply stores to protect these cards. Download and print this center-of-mass target to practice your self-defense shooting skills. Just click on the target to download the Adobe PDF file. If you have a buddy at the range with you, try this target. The Adobe PDF file has four pages - each numbered 1 through 4. Mount them as far apart on the target frame as possible. When ready, have your buddy call a number. Then another number. Then another number. Continue through at least one emergency reload. The goal is to hit the 8 inch printed circle with every shot. Hitting every called number? Speed up. Missing the circle? Slow down. If you can set multiple target frames, spread the targets out at different ranges for more of a challenge! Be sure and practice ammo/magazine management skills while shooting. Perform a tactical reload during pauses. If you shoot until you dry, perform an emergency reload ASAP. The gray-colored 8" circle on each target is actually a cross-hatched pattern to save on ink/toner. The center bullseye is 2" in diameter. © 2019 Personal Security USA All Rights Reserved.